From left to right: Rowdy Tellez, Anthony Alford, Shane Dawson, Ryan McBroom. 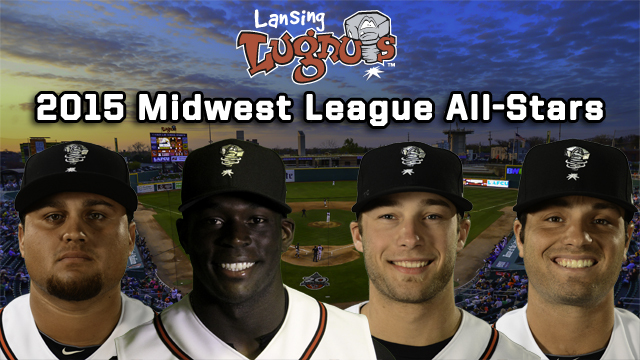 LANSING, Mich. - Four Lansing Lugnuts, including three members of the starting lineup, were named Midwest League midseason All-Stars, announced by the league office Thursday afternoon. First baseman Rowdy Tellez, center fielder Anthony Alford and designated hitter Ryan McBroom were all selected to start for the Eastern Division, with pitcher Shane Dawson chosen among the team's 15 hurlers. The 51st Midwest League All-Star Classic will be held at the Peoria Chiefs' Dozer Park on June 23rd. 20-year-olds Tellez and Alford each entered the season rated among the Blue Jays' top prospects, ranked #30 and #18 in the organization respectively by Baseball America. After brief cameos with the Lugnuts in 2014, each has met with dominant success this season: Rowdy Tellez leads the MWL with 41 RBIs and ranks second with 94 total bases and fourth with 60 base hits. Anthony Alford tops the league with a .446 on-base percentage, rating second with 35 runs scored and tied for third with 33 walks. McBroom, 23, has followed up a 2014 All-Star campaign in the Northwest League with a similarly productive 2015. The West Virginia product is batting .307 and has 16 doubles, tied with Tellez for second in the league. On May 31st, he went 5-for-5 at Fifth Third Field against the Dayton Dragons. Southpaw Dawson, 21, leads the Midwest League with seven victories, striking out a team-high 53 batters while holding the opposition to a mere .237 batting average. The Eastern Division-leading Lugnuts (31-22) play the second game of a three-game series against the Burlington Bees at 7:05 p.m. today at Cooley Law School Stadium. The game is a Labatt Thirsty Thursday featuring $2 beers and sodas. For more information, visit lansinglugnuts.com or call (517) 485-4500. To sign up for Lugnuts Alerts, text LUGNUTS to 80373.